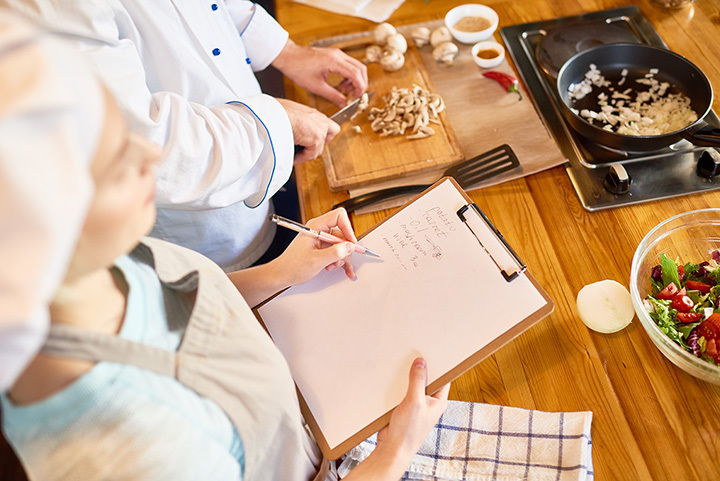 If you’re looking to take your culinary skills to the next level, the great cooking classes of Washington State will transform you into a master chef in no time. Whether you’ve always wanted to be a better baker or you’re dabbling in international cuisine from across the globe, you’ll find a class to suit your taste and style in Washington. Here are the 10 best in the state. If the idea of learning the culinary arts in a successful restaurant in downtown Seattle interests you, then the Art Institute of Seattle is the place to be. The Portfolio Restaurant is the working lab for students enrolled in the school, and gives hands on experience for education during the week and is open to the public on the weekends. Students learn how to use the equipment and techniques, then get to put them into practice as a team. Scholarship and other tuition aid information is available upon request. For over 45 years, Sur La Table has been Seattle’s leading home for cooks with all things related to the knowledge and passion behind cooking. With more than 100 locations across the country and a cooking program that is second to none, you can take your passion for fine food and ignite it into a culinary career or improve your art of entertaining. Cooking classes are offered in the store, online, or as a private event. Do you want to learn to cook? At Bon Vivant School of Cooking, you learn more than the basics of fine food preparation. You’ll meet new friends, build your confidence in the kitchen, and become an innovative cook. Bon Vivant offers classes that will expose you to French cuisine and techniques, like the four-class series, “Insider Secrets to the French Patisserie,” where you’ll learn to make mousses, meringues, tarts, custards, creams, and Dacquoise. Private cooking classes are also available and you can volunteer to use your own kitchen and attend free. Students of all ages can learn about cooking styles and flavors from the Pacific Northwest and around the world at Bayview School of Cooking in Olympia, Washington. Hands-on classes are the best way to learn new techniques and practice the basics about equipment used in the kitchen and safety. Kids aged five and up are encouraged to participate in the Kids in the Kitchen program where they can learn age-appropriate skills and try new foods. There’s a free class open to the pubic the first Thursday of each month, so check the website for times. Offering classes that focus on a variety of cooking-related events like traditional foods and technique, family-style dinners, power lunches, and cooking for kids, the Pantry in Seattle, Washington, is a true community kitchen. Opened in 2011, the Pantry brings together people with a passion for cooking and sharing their expertise with others. There are over 45 classes available for would-be chefs, foodies, food writers and photographers, and anyone who just enjoys cooking and wants to learn more. And the best part is that you get to eat what you make. Did you ever think of cooking as a team sport? That’s the idea behind the success of Sizzleworks. Located in Bellevue, Washington, the school has earned the title of “Best Small Business” and “Best Group Activity” from 425 Magazine, has been ranked in the top 35 best culinary blogs on the Internet by Feedspot, and is has been rated in the “Top 19 Cooking Teachers” in the Seattle Metro Area by Expertise.com. If you prefer, you can schedule a private event, but all classes are hands-on and lots of fun. Founded by Renee Press in 2011, Fire and Earth Kitchen brings a love of vegan and gluten-free cooking to groups in conference rooms or private homes. Using original recipes of her own creation, Renee isn’t afraid of a challenge, but loves sharing nutrition facts and her knowledge of plant-based cooking to audiences of all kinds. Her classes have been enjoyed by companies like Pier 1 Imports, NOAA, and many more. If you love cooking and baking but have a passion for sweet things, Dawn’s Candy and Cake offers great classes on how to make and decorate your own delicious treats. Located in Lynnwood, Washington, classes are offered by appointment every day from 9 a.m. to 9 p.m. except Sundays from 10 a.m. to 6 p.m. All supplies are included in the class fee, and all you have to do to register is stop by the store or call. Want to put the “oh là là” in your cooking? Then sign up for a class at Bellevue’s Paris Eastside where you’ll learn how to make macarons, eclairs, pastries, and savory dinner entrees. With a believe that anyone can learn to cook, the talented and professional instructors at Paris Eastside love to share their experience with French foods. Team building exercises can also be scheduled any time of the day or evening and are a great way to get to know each other in groups from six to 20. If you love cheese, what could be better than learning to make your own? Known as a classy school of curiosity, River Valley Cheese in Issaquah, Washington, follows the principle of engaging students in the journey of artisan cheese-making by offering hands-on experiences. Private classes can be scheduled, too, as well as team-building exercises.